Ships from and sold by millbrae cdrom. In her uncanny portrayal of one of England's most remarkable monarchs, Prunella Scales is light years from the comically regal character Sybil that she made famous on Fawlty Towers. This astute profile of Victoria, based on the Queen's own letters and journals, reveals much about an enigmatic woman and her hold on the public. 51 min. VHS. 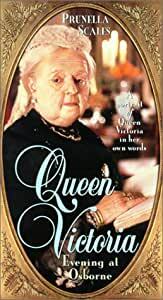 Queen Victoria: Evening at Osborne, is essentially a one woman show starring Prunella Scales, a great character actress (her depiction of Victoria's great-great-granddaughter Elizabeth II in "A Question of Attribution" is superb). Unfortunately, neither Scales nor Queen Victoria shine here. Most of the time the Queen is shown as an octogenarian, reminiscing about her past and her family. At odd times the setting shifts backwards forty or fifty years, showing the Queen in youth or middle age. Nearly all of the dialogue is taken from the Queen's speeches, letters, and diaries. This is done well, as it shows Victoria's character, both positively and negatively, in her own words. The show could have been better if it had shown the Queen interacting with Prince Albert, Lord Melbourne, Disraeli, John Brown, or her mother and children rather than just talking about them. Instead, all we get is one woman droning on and on and on. Perhaps someday Prunella Scales can do Victoria in a movie or mini series with the scale to truly depict the Queen. The video is short (45 minutes) and at times confusing as it cuts between late 1900 and earlier periods in Victoria's life. Even a Victoria Buff like me was often trying to place and event or a comment into its proper decade on more than one occasion. I found this distracting, confusing and not adding to the entertainment value of the piece. It certainly did nothing to add to the educational value of the film. Without the pomp and circumstance that surrounds the Royal presence, it was very hard to place the woman herself into a good context. It just seemed like a forgotten old lady in the corner of a nursing home talking to herself in lieu of any visitors. Had a cast of thousands and my wife and I watched it together. Now we want to learn more. Extrordinary film.